it's a journey: The NZ Wheels of Fortune Give Customers The Chance of WINNING a MERCEDES-BENZ and more! The NZ Wheels of Fortune Give Customers The Chance of WINNING a MERCEDES-BENZ and more! Do you want to get lucky??! No doubt owning a Mercedes-Benz is already a symbol of good fortune, but what if already owning a Mercedes-Benz meant you stand the chance of winning another? In a year-long giving away extravaganza, NZ Wheels is giving all its customers this amazing opportunity! If ever there were a time to try your luck, it’s now! 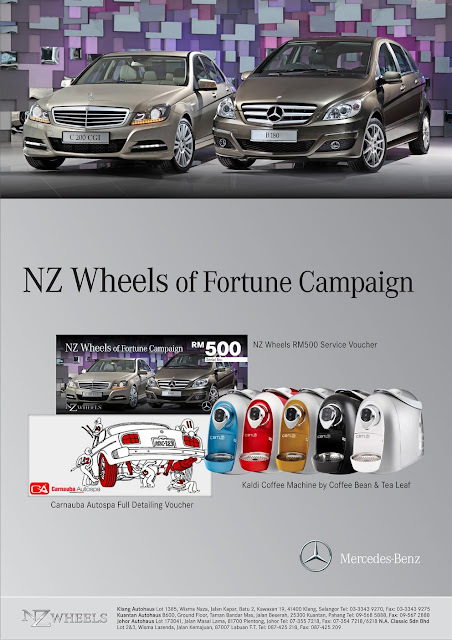 The campaign which began last month enables NZ Wheels customers to be in the running to win a Mercedes-Benz C200 CGI in a lucky draw that will take place on 15th May 2013. It’s as easy as servicing your Mercedes-Benz at any NZ Wheels service centre over the next year. The odds are in your favour and there’s a high chance that you will emerge a winner of one of these fabulous prizes. 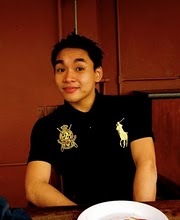 “NZ Wheels is committed to providing exceptional after-sales service to our loyal customers. Through the NZ Wheels of Fortune lucky draw; we are showing our appreciation and rewarding them with substantial give-aways. There’s a Mercedes-Benz to be had and it’s certainly an opportunity not to be missed!” stated Datuk Wira SM Faisal Tan Sri SM Nasimuddin, Joint Group Executive Chairman of NAZA Group of Companies. Grand Prize: Mercedes-Benz C200 CGI (x 1) During period 1st May 2012 till 30th April 2013. It’s an opportunity of a lifetime with fantastic prizes awaiting many lucky NZ Wheels customers. Visit your nearest NZ Wheels dealership or the NZ Wheels Facebook Fan Page to find out more about the terms and conditions of the lucky draw. More exciting information about NZ Wheels may be obtained at http://www.nzwheels.mercedes-benz.com.my and http://www.facebook.com/nzwheels. Follow @NZ_Wheels for the latest updates and offerings of NZ Wheels.